2014’s art theme, Caravansary, will extend this logic one step further by merging CORE with the interactive art pavilion of the Burning Man. Our plan is to bring the Man back down to the ground, closely encircle it with a tented pavilion framing a courtyard, and invite our regional communities to co-create this space. There is ample precedent for doing this. 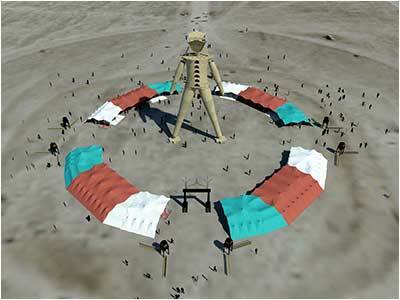 Since the very early years of Burning Man, the Project has designed and curated complex interactive art environments. An illustrated essay, The Early Years, is a detailed history of these efforts, and is highly recommended reading for anyone who wishes to participate in this adventure. Interactive environments are most engaging when they tell a story. The spine that is the story we intend to tell is described in the following passage from our theme announcement. "This is not a tourist destination, but a home for travelers who come here bearing gifts. Amid the twisting and the turnings of its souk, participants will come upon an inexhaustible array of teeming goods and unexpected services. Anyone may pose as 'merchant' here, and anyone may play a 'customer', but nothing in this strange emporium shall have a purchase price -- no quid, no pro, no quo -- no trade at all will be allowed in this ambiguous arcade. According to a rule of desert hospitality, the only thing of value in this marketplace will be one's interaction with a fellow human being." We may conceive this as appropriating the culture and the manners of traditional marketplaces such as one might find in a bazaar, while simultaneously regarding every article of commerce as a gift, a sort of decommodity. This is premised on an essential idea: the value of a gift is unconditional. Gifts in this conception do not pass from hand to hand, they pass from heart to heart; it’s not that we possess a gift; it is that it possesses us, and therein lays its transformational power. 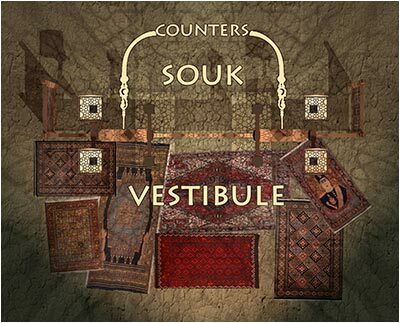 Gifts may therefore be said to be bearers of being, and for purposes of play within our souk, this signal fact shall be regarded as a "trade secret." Translated into practice, this means that it is perfectly okay to employ all means of salesmanship involved in soliciting "business" or extoling a "product." But it is emphatically not okay to entertain any form of exchange value. A gift may be given, and a gift may be received, but true gifts cannot be trammeled by a self-regarding expectation. For example, should someone offer a gift to a merchant, that merchant has the option to accept it -- graciously receiving gifts is a part of the art of gifting. But should the giver then demand things in return, this is, while not a sin, most certainly a breach of etiquette. As this example suggests, our interactive premise has one foot planted in the culture of gifting, and another firmly fixed in the customs of commerce. Discovering that subtle and wavering line that distinguishes these two value systems will be a large part of the fun. This can be further illustrated by another hypothetical interaction. A customer has entered a shop; a merchant exhibits its goods. Any merchant worth his or her salt will extoll each item -- much as a lover who dilates on the beauty of a loved one. Be it only a torn shoelace, its many perfections could be seen to house further and more subtle perfections, if only one can be induced to see it with infatuated eyes. Yet, should any customer request to possess it, this might be where salesmanship abruptly ends, since anyone knows that it is always bad form to demand a gift. The merchant then might gravely gaze into the eyes of his or her partner in this interaction, saying, "This treasure has been in our family for thirteen generations. It is part of who we are and it is not for sale." On the other hand, this same interaction might branch in a completely different direction. If, for example, a customer should really fall in love with any item that's displayed—so deeply enthralled that they grow self forgetful, abandoning themselves to admiration of the thing itself -- saying, "I just love this. It’s so me,"it then might be appropriate to say, "This has been in our family for thirteen generations, but we have only held it for you -- it has always been yours." Such interactions are not bound by rules, so much as they are features of a sensibility, and they may permutate and circle round until they bear an uncanny resemblance to haggling. At the level of simple farce, this is like a long and complex shaggy dog story, an interaction that has no apparent end, a delightfully droll collision of social and economic assumptions. But at a deeper level, its success depends upon a studied exercise of empathy: a willingness to make intimate and immediate contact with perfect strangers and, whenever possible, authentically bestow a gift. The entire history of Burning Man is about constructing contexts that support community and collaboration. The conceptual premise outlined above supplies a frame for interaction, but the content of this world we co-create must come from those who will embody it. Unlike the large-scale sculptural projects that have previously characterized CORE, participation in the Caravansary can be made widely accessible to many different kinds of people. There is really no logical end to the various roles and activities that can be contributed to this effort. For example, in any normal marketplace businesses must always train a very careful eye on their competitors. And for purposes of burlesque, these faux shops may satirize the manners of capitalism, sending out touts to befriend customers or using barkers to attract attention. It really wouldn’t be amiss to advertise a shop as "Going Out of Business." The French term “mise-en-scène” refers to the arrangement of actors and scenery on a theater stage. More broadly, it evokes one’s sense of a surrounding world, its picturesque context, as in a narrative or movie. One of our essential aims in designing this year’s interactive space is to induce such a feeling. 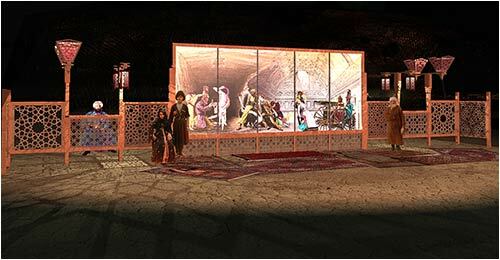 In 2014, our Caravansary will represent the ancient world of Classical Persian culture -- the era during which the Silk Road and its roadside inns, the caravansaries, achieved their highest stage of civilized development. Lanterns, carpets, tented pavilions and filigreed screens will generate the aura of a fully integrated culture. We also hope to further paint this scene, with the inspired aid of Caravansary volunteers, using fabrics dyed in hues of scarlet, saffron, turquoise, sage, maroon and Persian blue. The architecture of the Caravansary will feature tents that form a circular arcade. These will be divided into two equal parts. 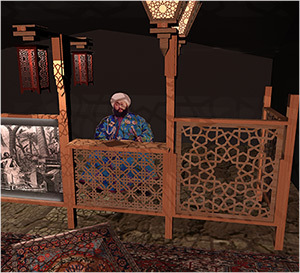 Vestibules in the forepart of each tent will form cushioned public lounges that face the Caravansary’s central plaza. Behind these we will house our shops. Fronted by ornamental screens indented by counters and provided with side entrances, these capacious spaces may be subdivided and most certainly should be furnished and decorated by our shopkeepers. For safety reasons, neither open flames, kerosene lanterns or generators will be allowed inside these tented structures, but a limited amount of electricity will be available. The things that might be offered by these shops may include services, both useful and strange, amenities, such as cooling beverages or tea, and performances. In the spirit of Radical Inclusion, drop-in contributions by the general public should be welcomed whenever appropriate. Furthermore, we encourage participants to preserve the spirit and history of the original CORE movement by creating gifts that represent the identity of their home communities.